The first round of the OHL playoffs wrapped up without any upsets. For the second year in a row, all four top seeds in each conference made it through to the next round, and we didn’t see any game sevens along the way. We did however see series sweeps for the Sault Ste. Marie Greyhounds and Owen Sound Attack, who are set to meet in one of the Western Conference finals. 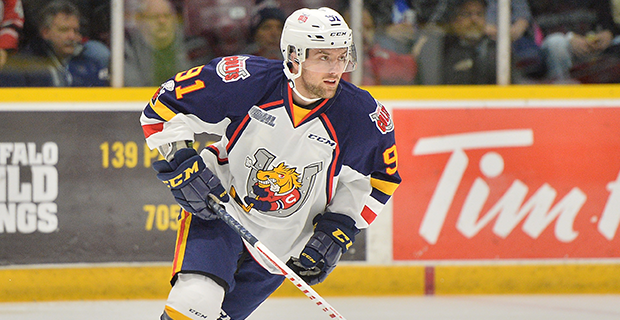 The second round kicked off Wednesday night, with the Barrie Colts defeating the Kingston Frontenacs 6-5 in overtime. Here’s what to look forward to with just eight teams remaining in contention. The Bulldogs have been the best team out of the East for most of the season, but the IceDogs have had their number this year as Niagara only lost one out of six regular season meetings against Hamilton. That loss was in overtime while they also won two games in the extra frame. Hamilton has relied on a heavy veteran presence to get to where they are now while Niagara is a younger squad with a core built for the future. Both teams won their first-round series in five games: Hamilton defeated the Ottawa 67’s and Niagara disposed of the Oshawa Generals. Fun Fact: With 31 regular season goals, Hamilton’s Arthur Kaliyev is the first 16-year-old to score 30 goals in the OHL since Alex Galchenyuk scored 31 in 2010-11. We could be in for an eventful series with these two teams, especially if their opening game was any indication. There’s plenty of star power on both teams, especially since they were aggressive on the trade front around the deadline. The Colts made it past the Mississauga Steelheads in a six-game conference quarterfinal, even though Barrie allowed a league-high 252 shots against in that series. By comparison, the Frontenacs knocked out the North Bay Battalion in five games, beating them by three goals three times before sealing the series with a 6-5 win in triple overtime. Fun Fact: Barrie defenceman Tyler Tucker’s three goals in the first round matched his goal total through 59 regular season games. The Greyhounds made serious noise this season with a 23-game winning streak and just 13 losses, seven of them in regulation. There isn’t much reason to favour anyone else more than the Soo as far as the league’s championship picture is concerned. Still, no one can overlook the Attack, who are on quite a roll now with 10 straight wins, including a sweep over the London Knights to move on in the playoffs. All of those wins against London were by a single goal, two of them in overtime. Meanwhile, the Greyhounds steamrolled past the Saginaw Spirit in the first round, outscoring them 25-8. Fun Fact: Drew Bannister played for the 1993 Memorial Cup champion Greyhounds and is now trying to coach the Hounds to a Memorial Cup. Although the Rangers are the higher seed, by way of winning the Midwest Division, the Sting put up the second most points in the league, but finished third in the conference since they trailed the Greyhounds in the West Division. Kitchener had the edge through the regular season with three wins in a loss in overtime against Sarnia. The Rangers and Sting are on similar footing entering the playoff matchup as they won their first-round series in six games. Sarnia defeated the Windsor Spitfires and Kitchener won over the Guelph Storm. Fun Fact: Since moving to Sarnia in 1994, the Sting have never made it to a conference final. Their last second-round appearance was in 2008.